By a stroke of luck, an adorable calico kitten was recently rescued in New York after a Brooklyn photographer spotted the kitten hiding under the hood of an adjacent car on the road. Antonio M. Rosario noticed the crying kitten inside the housing of a missing turn light signal to a Mercedes S550 and immediately asked the car owner to pull over in order to rescue the terrified feline. Rosario has since adopted the kitten, appropriately naming her Mercedes. 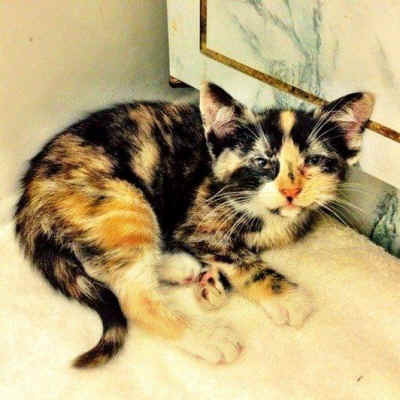 Read on for more on this touching tale and check out the pictures of this recovering calico. An adorable calico kitten has been given a second chance at life thanks to a quick-thinking New York man who rescued her from a car engine. Brooklyn-based photographer Antonio M. Rosario said it was sheer luck that initially led him to the trapped kitten. “If we had been a minute off in any direction, this would never have happened,” Rosario told TODAY.com. Rosario was driving with his wife when he spotted the distressed kitten. “In the adjacent lane, I see a Mercedes s550 with its left front turn signal light missing from the housing. In this housing is the little face of a kitten crying,” Rosario wrote in a blog he created to share the furry feline’s tale. Rosario immediately signaled to the woman driving the car that she needed to pull over. Unfortunately, the driver had no idea how to open the hood. Rosario adding that he was becoming increasingly concerned that the kitten would die because of the heat. By this time, a small crowd had gathered and several people stepped forward to lend a hand. Finally, with the combined effort of those gathered, the hood was finally popped open and Rosario was able to entice the kitten out with some food. Relieved, Rosario gathered the kitten into his arms. Rosario has since taken the kitten home. Other than some conjunctivitis in her eyes and possibly some worms and fleas, she is doing very well.